It is gross over-development for such a small site. Two-and-a-half-storey terrace houses immediately behind the existing bungalows are totally out of keeping with the neighbourhood. These houses were originally going to be three-storey town houses, but many local residents raised objections at the brief consultation so they have now been reduced to two-and-a-half storeys. They are still totally unacceptable as they will still have three floors of windows looking down on existing bungalows. The best practice guide states ‘no overbearing impact on neighbouring amenities’ – this is being ignored. The residents in the bungalows in Bancroft Road and Newlands Avenue will have no choice as we will not be able to afford to move, and our properties may well lose value. The hotel with four storeys is too large and will be overlooking the properties in London Road. Removal of 114 trees – only one oak tree has a preservation order. Dismissing the rest as dense shrubbery groups where of course wild life thrives, is appalling. Destroying this number of trees is pandering to the developers who want a clear flat area for easy building. We do not want the Drill Hall demolished, it is over 100 years old and the original hall next to this one was demolished in 2006. There are very few drill halls left in Sussex and the report for this site states: the site suffers of elements of poor visual and townscape character from the loss of the High School. And the builders want to take the bulldozers to the only building of character in the area! So why is this hall, which is for character building for young people, going to be pulled down? Is it simply to pander to developers? The report also states Rother has a responsibility to protect leisure and swimming facilities. Surely that also applies to the drill hall? If all of this development is allowed to go ahead the traffic will be horrendous. The current leisure centre has some 70 parking spaces at the front of the building, during evenings and on Saturdays all these spaces are taken. During school times Down Road is impassable as parents taking their children to school simply have to park on double yellow lines. The number of parking spaces of 150 with the new development will be totally inadequate. One mini roundabout will not alleviate the traffic issue and will be exasperating for deliveries to a hotel and restaurant including coaches. 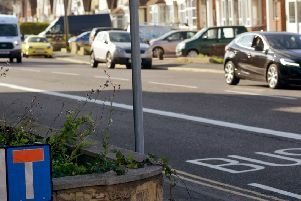 If the site is short on parking spaces or charges for parking, many people will park in Bancroft Road (which is unadopted) or Newlands Avenue. We should be given reassurances that we can have a ‘residents only’ parking scheme. Flooding: if there is rain for 24 hours nonstop Little Common Road floods and is only passable with one way traffic down the centre of the road and this is mentioned in the report. Southern Water states there is ‘limited wastewater capacity on this site’. ESCC want to promote the principal of no longer a priority on vehicle movement – get real, cars on the road are only going to increase with thousands of extra houses being built in the area! Jeff Pyrah of Rother has stated ‘the indicative layout hasn’t demonstrated that the quantum of housing proposed can be satisfactorily accommodated’. If we wanted to live in a London-style town house density area, we would live in London.